Did you know that you get more than twice as much fire protection from an SFI-5 rated suit versus an SFI-1 rated suit? Did you also know that there's about a $200 difference between a single-layer and double-layer suit? How many square centimeters of skin graft can you buy for $200? Formula 1 and all racing world owes its high safety standards not only to the use of computer technology and high-tech materials in the construction of the cars but also to the consistent enhancement of the helmets and racing overalls. They not only protect the drivers from injury in emergencies, but also give them a feeling of security. The first fire-retardant racing suit was manufactured by the Indianapolis company J.B. Hinchman over 80 years ago. Conceptually, the suit has changed little over those eight decades. The idea is still to provide protection from fire. However, today's suits bear little resemblance to their early counterparts. High-tech materials, proprietary stitching patterns, and fashionable designs not only set you apart in the winner's circle, but also save your life on the track. Driver's clothing has a very important part to play in racing - it offers the drivers great protection against the risk of fire. Fires are becoming rarer in Formula 1, however they are still an integral part of the safety equipment that all teams use. Overalls, boots and gloves are all made from special fire proof materials that ensure that if the driver does become trapped in a burning car, he will be protected until the flames can be extinguished. In the founding years of Formula 1, between 1950 and 1960, the dress code was primarily directed towards comfort and elegance. 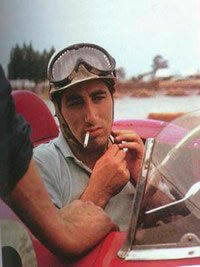 The legendary Juan Manuel Fangio preferred to drive in a polo shirt and cloth trousers with a balaclava on his head, which at best gave him relatively good sun protection. On picture right you can see Alfonso de Portago preparing for his race. Even in the 70s, the racing overalls were made of easily inflammable cotton and it was only after Niki Lauda's fire (picture down) accident on the Nürburgring in 1976 that attitudes changed. From then on, things moved quickly. In 1979, Lauda, Carlos Reutemann and Mario Andretti competed in overalls made of five layers of fireproof material, as used by NASA for astronauts' suits. Nowadays, there are two materials that are used extensively in the manufacture of driving suits, Proban® and Nomex®. Proban is a cotton-based material that has been chemically treated to make it fire retardant. This treatment may diminish with washing. It is used primarily in single layer economy suits although there has been a disturbing increase in manufacturers using it to manufacture inexpensive multi-layer suits. But Nomex is inherently fire retardant and it's protection does not diminish with time or washing like in Proban case. In high quality driver fire protection, not only the overalls but also the boots, underwear, gloves and face masks are all made of the special synthetic fiber, Nomex. It is so resistant to heat and fire that drivers in a Nomex-3 overall can easily survive at least 35 seconds in temperatures of 850°C, which is roughly equivalent to the heat in a house fire. This material also protects the driver against caustic gases and acids. Nomex is a permanently fire retardant Aramid fiber that is manufactured by DuPont. It is woven or knitted into material by one of several mills in the worls. Fire-Retardant Suits is perhaps the most recognizable piece of racing gear, which is emblazoned with patches of the team and driver's sponsors. These suits are almost as recognizable as the drivers themselves. While most of us think of this suit as a walking billboard, it is actually quite important for the safety of the driver. The suit is made out of either Proban or Nomex. As mentioned before, Nomex is a fire-retardant material that protects the driver and crew if there is a flash fire in the pits or a fire resulting from a crash. No amount of laundering, or wear and tear, can remove the flame resistance from apparel made of Nomex brand fiber. Nomex has a 30 year track record of successfully protecting wearers in a number of different occupations. From traditionally styled work wear for refinery, chemical plant and electric utility employees, to multi-layer garment systems for military jet pilots, firefighters, and race car drivers and their pit crews, Nomex® takes the heat head on and enables the wearer to focus on the task at hand. In some jobs, what you wear can save your life. With its proven reliability and heritage, you can be secure knowing that Nomex will perform when it needs to so you can perform when you need to. The Nomex is woven into a material that is used to make the suit, gloves, socks and shoes worn by the driver. There are natural polymers, like spider silk and natural rubber, as well as polymers like Kevlar and Nomex that are made in the lab. In the case of Kevlar and Nomex, the lab was that of DuPont. You may have heard of Kevlar®, which is a material used to make (among other things) bulletproof clothing. If you didn't, read my articles about Kevlar and Nomex. Kevlar has a first cousin named Nomex.® Both are polymers, which means that they are made of a unit, called a mer, that is repeated over and over to form a long chain. 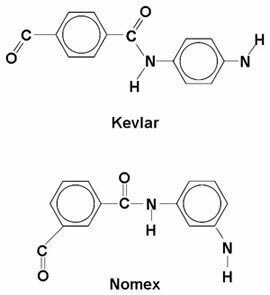 If you look at these Kevlar and Nomex molecules for a few moments, you'll notice that they are almost identical. They have the same atoms arranged in the same order. The big difference is that the carbon (C) and nitrogen (N) atoms attached to the phenyl groups are attached directly opposite each other (at a 180 degree angle) in Kevlar, while they are at an angle of 120 degrees in Nomex. That difference gives Nomex slightly different, but very important properties than Kevlar. Spider silk is an incredibly strong material, as a strand of spider silk is stronger than a piece of steel the same weight. Kevlar is a similarly strong molecule. Because Kevlar molecules are straight, they pack very nicely. The phenyl groups are so large that there aren't a lot of ways the polymer chains can stack with each other. The chains link by hydrogen bonding, which is sharing electrons between the hydrogen and the oxygen of adjacent chains. Hydrogen bonding is much stronger than Van der Waals bonding, which holds Nomex together. The combination of regular stacking and hydrogen bonding make Kevlar five times stronger than an equal weight of steel. On the negative side, Kevlar starts to melt at about 500 °C. The bonds between the atoms weaken and the solid polymer turns into a liquid. Because gasoline fires can burn around 982 °C - 1149 °C and methanol fires can reach almost 1927 °C, Kevlar doesn't make such a great firesuit material. The kink in the Nomex molecule makes it harder to align, which means that Nomex is not as strong as Kevlar; however, Nomex doesn't melt. When the temperature reaches about 370 °C, the atoms in Nomex re-arrange and form a protective carbon coating around the outside of the polymer fiber. The carbon helps in four ways: First, the some of the heat energy is used in forming the carbon layer, which means less heat available to get to the person wearing the firesuit. Second, the melting temperature of carbon is a whopping 3777 °C. Third, carbon is a very good thermal insulator, which means that if it is hot on one side of the carbon, it takes a long time for the heat to get through to the other side. Finally, the Nomex fiber actually gets thicker when it forms its carbon coating. Firesuits are woven and when the fiber gets thicker, the weave gets tighter and keeps air out. The only negative about the carbon layer that forms when Nomex is heated is that when the charred fabric cools, it becomes brittle and weak, just like paper that gets burnt crumbles. But when fabric cool down, who care. Danger is over. There are essentially three types of suits: single-layer, double-layer, and triple-layer. In addition, you have one, two, and even three-piece suits. Drivers need to wear one-piece suits, and crewmen can choose from any of the three multipieces depending upon their race-day duty. SPARCO X-Light Driving Suits used by many of the Worlds best professional drivers and teams, including a large number of Formula 1 teams, feature an ATT or Air Textile thread inner layer which allows up to 25% more transpiration then Nomex. An increase useful additional feature is the inclusion of the new X-Cool chemical treatment. This treatment draws heat from the body surface and actually cools the driver down. The ultra high quality shiny outer Nomex layer ensures that the amount of material thickness required is kept to a minimum reducing weight and further increasing driver comfort. A 2 piece design of epaulette is used which removes material in the area on the shoulders where a HANS device is located. This avoids excessive pressure on driver when harnesses are tightened onto the device. Soft knit double Nomex layer collar and fully floating sleeves are applied for increased comfort. A breathable, moisture and heat wicking inner layer ensures driver. To make sure the overall does not cling or pull anywhere, a particularly flexible material is used for the shoulder and lover beck area. Elastic cuffs on wrists and ankles and is made of two to four layers of Nomex. Breathable materials are also used in the production of the overalls, which have varying thicknesses depending on the particular race. Each Formula 1 driver uses approximately 16 suits per season. A completed multi layered overall undergoes 15 washings as well as a further 15 dry cleaning processes before it is finally tested. It is then subjected to a temperature of 600 to 800 degrees Celsius. The critical level of 41 degrees Celsius may not be exceeded inside the overall for at least 11 seconds. The zip on the suit must also be able to withstand the same temperatures and must not melt or transfer heat close to the driver's skin. Even the patches on the suit and the thread used to sew it together must be fire resistant. On top of all that, the suit needs to be light and breathable, to allow the several kilos of sweat produced by the driver during a race to escape. The suit must also have two large 'handles' on the driver's shoulders. These straps must be capable of supporting the combined weight of the driver and his seat, which in the event of an accident can be removed from the car by marshals 'as one', in order to minimize the risk of complicating injuries. The driver's gloves are also made of Nomex® and are thin, with suede leather palms to provide the sensitivity of feel necessary for steering. Special treatment has been designed to guarantee rigidity and grip on the palm of the glove. In fact, excessive deformation of the fabric can reduce driving sensitivity. The incisions have been positioned to favor the natural movement of the hands and bending of the fingers as much as possible. The padded reinforcement on the knuckles protects the driver's hands from violent contact with other parts of the driver's cab. The driver's fireproof ankle boots are made of soft, cushioned leather and, similarly, their rubber soles are far thinner than those of ordinary shoes to provide accurate and slip-free contact with the car's pedals. Underneath his race suit the driver wears a further layer of flameproof underwear, and under his helmet a fireproof balaclava. Deciding how many layers you need in your racing suit presents a common question: What I need for my racing adventure? Here's a great question to ask yourself after looking at price chart: How fast can the safety crew at your local track get you out of a burning car? If they can do it in 3 seconds, go ahead and buy that $99 single-layer special and drop me a note telling me your home track because I want to race there. It all comes back to what materials are being utilized in the suit. Is it Proban or Nomex, or something else? The quality of any fire-retardant material can be determined by looking closely at two measuring factors: Limiting Oxygen Index (LOI) and Thermal Protective Performance (TPP). LOI is the most commonly used measure for flame retardancy and refers to the amount of oxygen needed in the atmosphere to support combustion. If a fiber or fabric has an LOI of 25, that means that oxygen needs to be present in at least 25 percent of the air for the fabric to burn. Consequently, a higher rating equals more fire protection. Many fiber manufacturers achieve high LOI ratings by chemically treating their fabrics with a flame-retardant finish. The downside is those chemicals can be washed and worn off over time without proper care. You won't often see LOI in race suit literature, but it is an important factor in good fire protection. On the other hand, TPP refers to the garment's ability to provide thermal protection when exposed to both direct flame and radiant heat while taking into account the length of time before a person is subject to second-degree burns. While that's a mouthful, TPP is the second most important number you need to know when shopping for firesuit. The TPP rating is derived from a mathematical calculation performed with the results of a sophisticated test procedure that utilizes two different heat sources, sensors, and the fabric to be tested. The TPP rating is divided in half to determine the number of seconds until the human tissue reaches a second-degree burn. For example, if a particular fabric has a TPP rating of 35, it takes 17.5 seconds until a second-degree burn occurs in a flashover situation. The only way to increase a TPP rating is through adding multiple layers. However, as you increase layers, suits get bulkier, and bulk does not equal comfort. Your goal in selecting a firesuit should be the balance of comfort with maximum protection. Mom always told you to wear clean underwear-now we know why. A great way to increase the TPP without jumping up to a three-layer drag racing suit is to wear fire-retardant underwear beneath your suit. If your budget doesn't allow for fire-retardant underwear, even a cotton sweatshirt adds some protection. Some suit manufacturers promote the TPP rating of their suits alongside the SFI rating. Proban is commonly applied in economy suits due to its cotton base. The cotton fabric is impregnated with a chemical cocktail that initiates polymer formation that is irreversible. This polymer formation is the barrier that protects you from fire and intense heat. However, many racers and product specialists believe Proban to be lacking in longevity and prolonged protection. Nomex, on the other hand, is the most widely used material in fire suits. It is known for being far more consistent, durable, long-lasting, and protective. So getting back to the original question: Which is better - Single-Layer or Multi-Layer? Well, a single layer Nomex suit would actually stand a good chance at outperforming a multi-layer Proban suit - especially if both suits had already been through some wear. Ultimately, a multi-layer suit will provide you additional layers of protection, which is why professional racers and some leading amateur racing sanctioning bodies require a multi-layer suit that meets specific of SFI and FIA ratings. But, not all of us are professional racers or even amateurs. And we all certainly cannot spend the same amount of money on racing suits that professional racers can. Most of us are just looking for what it will take to keep us safe, and the rest is simply luxury! In that case, the best thing you can do is determine your budget, and try to find the best suit for your buck. It may be a high-end single-layer suit made out of Nomex. Or maybe a multi-layer Proban suit is your best option. No matter what, keep in mind that having a suit is better than not having a suit. Even if it's single-layer Proban, it is certainly better than absolutely nothing. Just like there are different styles of men's and women's dress suits, there are different styles of racing suits. The primary difference is that auto suits are fire retardant/resistant and motorcycle/kart suits are abrasion resistant. 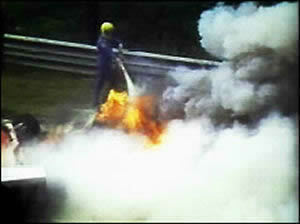 In auto racing, you have a higher risk of being involved in a fire. Of course, because you will be inside an enclosed vehicle, hopefully harnessed in, if you are in a fire, you will likely be exposed to it for a considerable amount of time. Therefore, the focus of design on an auto suit is protection from fire. But motorcycle and kart racers are susceptible to very different dangers. In motorcycle racing, the racer is at high risk of a high speed bail-out or simply losing control, which will result in sliding across pavement, gravel, grass, barrier walls, or even impacting with another bike. In karting, you are in an open cockpit vehicle, experiencing very high g's, very high speeds, and very sharp corners that can lead to being ejected from the vehicle, or on occasion, being dragged along the pavement or side-walls. Keep in mind, these dangers are rarely encountered, but they are real dangers nonetheless, and serious enough to protect yourself just in case. Because fire exposure is far less of an issue in motorcycle and karting, the focus is centered on abrasion resistance - the paramount danger and concern. You can also identify some subtle differences between the two styles in regards to fitting, cuff design, shoulder gussets, etc. Primarily, kart racers understand that space in the cockpit is slim. 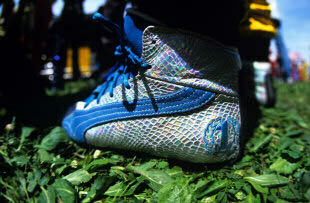 You can't expect to wear a baggy suit and be comfortable, much less be able to perform competitively. Karting Suits are designed with spatial consciousness in mind, which ultimately leads to a better experience for the individual wearing the suit. Moto-specific suits are also tailor-trimmed, but for different reasons. Aerodynamics plays a key role in all types of racing, but especially in motorcycle racing. Riders tend to be of small frame, so they can fit behind the façade of the bike. But the size of the rider matters little if the rider's protective gear negates it. Therefore, manufacturers design motorcycle suits to be streamlined and form-fitting, while simultaneously protective. 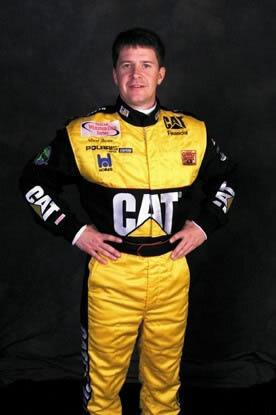 Ultimately, if you know you'll be auto racing, buy an auto racing suit. And the same applies to those who know they will be motorcycle or kart racing. After all, that's what they are made for! Just because they are all "Racing Suits," that doesn't mean they will protect you in the same ways. And never ever choose a suit solely based on its appearance. If you are going to spend the money, buy something that will actually benefit you in a way that actually counts! Products sporting the "TUV Homologated" stamp ensure that you, the consumer, will receive and experience premium performance via quality and safety. Since its birth in 1904, the Fédération Internationale de l'Automobile (FIA), has been dedicated to representing the interests of motoring organizations and motor car users throughout the world. It is also the governing body of motorsports worldwide. Products sporting the "FIA Homologated" stamp ensure that you, the consumer, will receive and experience the premium performance, quality, and safety afforded by contributions from FIA's global network of interested and pro-active members to affiliated manufacturers. So, if you happen to live in Europe, you may rest assured that any product stamped with this mark is deemed safe according to your governing region's standards and requirements for public health and safety. Each of these companies has an established reputation in the industry, whether it is centered on performance, quality, value, or any combination of the three. Sparco, Impact, AlpineStars, and Simpson are known as the high-end players. They offer very high-quality suits, with impeccable performance, and a lofty price to match. Of course, they each offer their own mid-range suits that are more affordable. Oakley is fairly new to the industry, but they have been designing some phenomenal products, including their firesuits. They are not cheap, but they are high quality. And soon they will likely rise to the status of Sparco and friends. In fact, Sparco has helped subcontract Oakley's line! Not a bad company to get some help from. And then G-Force and RaceQuip are the two value brands. They don't have the curb appeal of the more expensive suits, but they certainly get the job done, and for a lot less money! G-Force has been around a bit longer than RaceQuip, and has grown immensely in popularity and recognition. But RaceQuip is slowly moving into their territory. RaceQuip's competitive advantage is higher manufacturing quality at an even lower price than G-Force! Honestly, it would be no surprise if in the next few years, RaceQuip's prices go up as they gain a reputation for such great value. Most RaceQuip dealers are already begging the sales executives to raise MSRP because they know customers will pay it. Ultimately, it is great for all of us that there is some new, bold competition out there for this segment of the market. The more competition, the more affordable the products will become. And, we will get more for our money! There are certainly a lot of options out there, and these are just a few. But if you take a little time to figure out what "type" of suit you need, you will be in a good starting position. If you want to take the time to look through smaller independent companies, there is certainly nothing wrong with that. But you can certainly save yourself some time by sticking with one of the brands above - they won't steer you wrong!